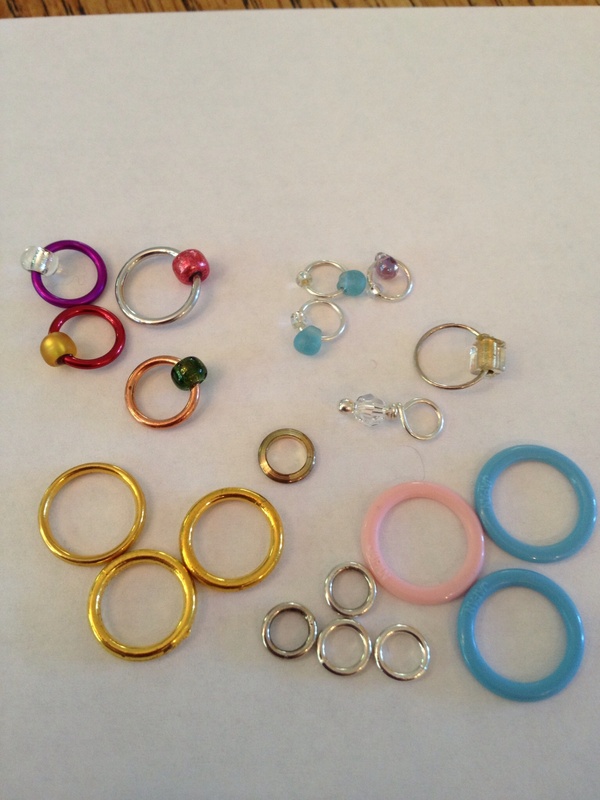 My knitting project bags always include (more than) a few stitch markers to help me keep track of where I am in a pattern or chart. I have quite a collection of markers in the various project bags that live near each of my knitting chairs, by the door ready for a short trip, or in the quiet room where I work on complex lace or color patterns. 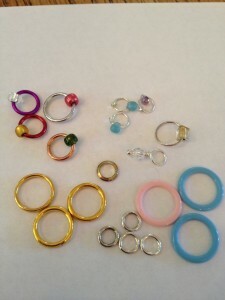 I use rings, locking markers, coiless pins. 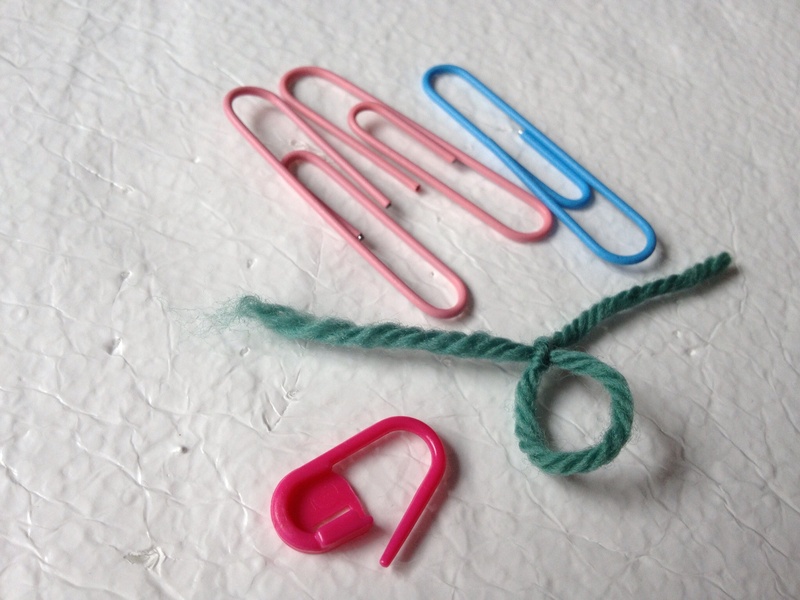 loops of yarn; even paper clips in a pinch. 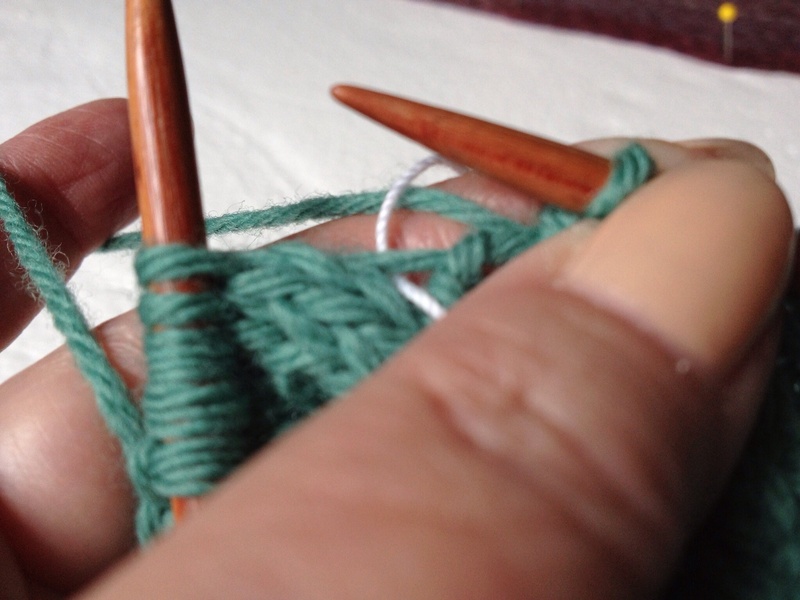 Recently I “unvented” (acknowledgement to Elizabeth Zimmermann) a new way to mark pattern repeats that start or end with a decease that uses stitches from two separate pattern repeats. 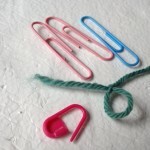 These types of pattern repeats start and/or end with a decrease require moving every stitch marker one or two stitches left or right with each decrease. 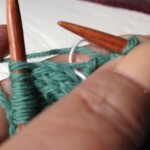 Moving the markers while in the middle of doing a centered double decrease (CDD) or a slip 2, knit 1, pass the 2 slipped stitches over (PSSO), or even just a knit 2 together (K2tog) or slip, slip, knit (SSK), is risky business. 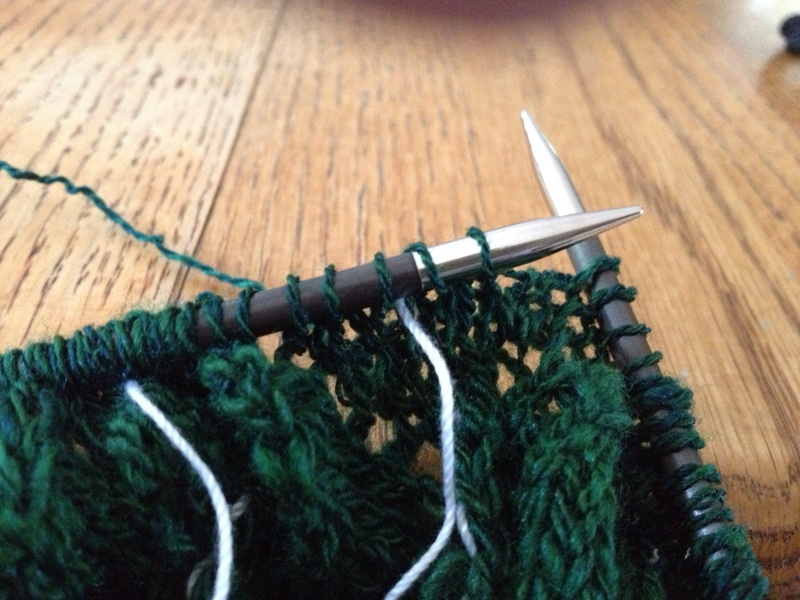 You have to slip the stitches to the right of the marker to the right needle, take the marker off and stow it somewhere, put the slipped stitches back on the left needle, perform the stitch maneuver and then find and replace the stitch marker. Markers of any kind that sit on the needle don’t work well in this situation. 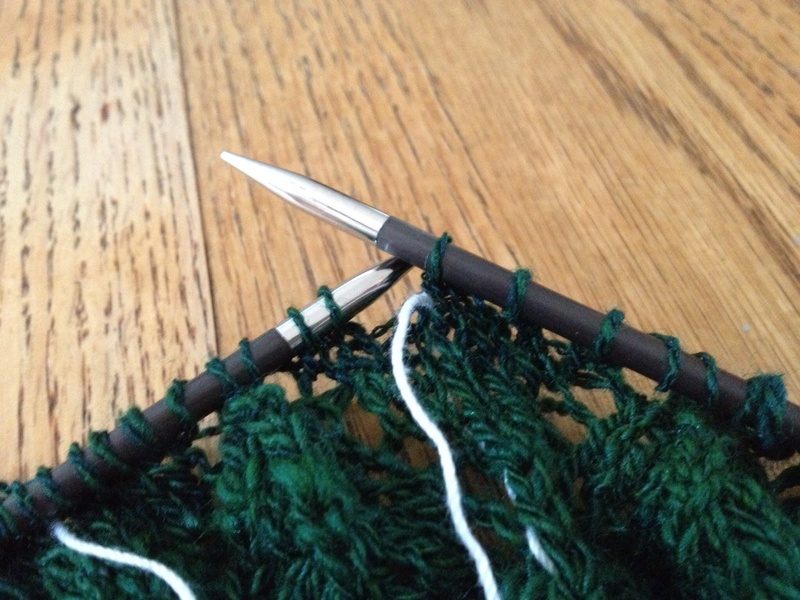 I recently finished a shawl on which half of the right side rows needed to have the stitch marker moved so a 2 stitch cable could be worked using one stitch from each side of the pattern repeat marker. The stitch that started out in the repeat to the left of the marker became the last stitch in the repeat on the right side of the marker. 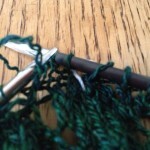 To mark these split pattern repeats I “unvented” a method using a smooth crochet cotton thread cut in 8 inch lengths. 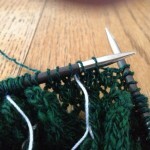 A fine smooth yarn in a color that contrasts with the working yarn would also work. When I got the place where the cable is worked (in this case, without using a cable needle) I knit the second stitch, wound the cotton thread around the working yarn leaving a short tail in front and a long tail in back, then knit the first stitch and slid both completed stitches onto the right hand needle. 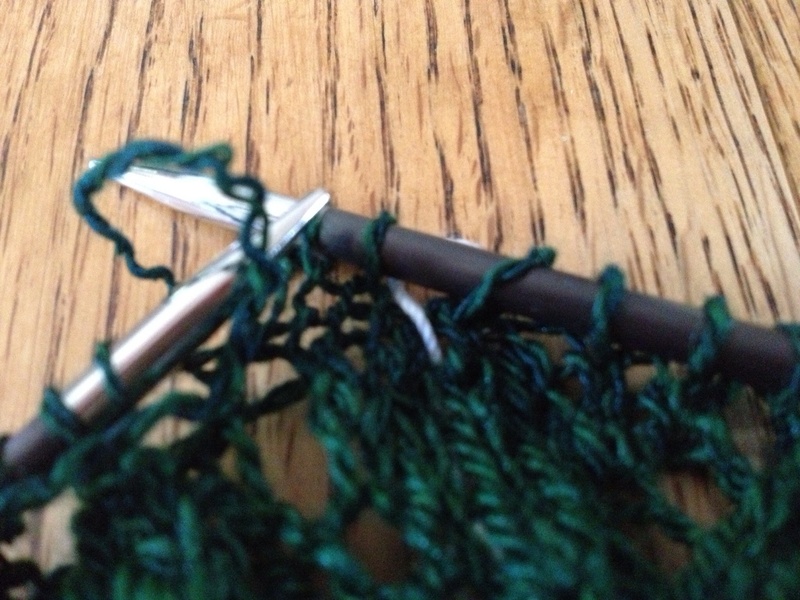 The marker thread ends up between the two stitches which is where the next repeat starts. On right side rows the thread is in front showing where the repeat ends and ready to be moved; when the stitches are completed the long tail is on the back side of the work. 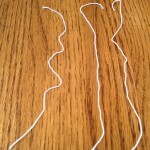 When the work is turned the thread is again on the front, ready to be moved. On the first row I wind the marker thread around the working yarn; on subsequent rows I just lay the long tail of the marker thread over the working yarn. When you have worked several rows the long tail can be gently pulled to free up a bit more for the long tail while the short tail remains in place in the work. The marker stays put and doesn’t get lost. Next I tried this method on a lace pattern that had a CDD that used 2 stitches to the right of the marker and 1 stitch to the left of the marker. 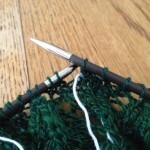 The resulting single stitch becomes the last stitch of the repeat to the right of the marker. With the cotton thread used as a marker, I simply worked the CDD, and place the thread over the working yarn after the CDD and motored on down the row. The next time I got to that spot in the row I moved the thread marker from the wrong side of the work to the right side over the working yarn, showing where the next CDD should be worked. The thread markers work for any kind of flat knitting; I have not yet figured out how to make them stay put on work knit in the round, but that is next on my list of making my knitting easier, allowing me to concentrate on the pattern and stitches I am working, without searching for dropped or lost markers. The latest pattern I am using this method for is the Madrona Scarf, a free pattern by Evelyn Clark at www.madronafiber.com. On Chart 2 rows 9, 11, and 13 in the repeat there is an SSK that uses one stitch from the right of the marker and one from the left of the marker. This happens again on Chart 3 rows 1, 15, 17, and 19. The thread-over-the-working-yarn method works perfectly on this pattern! 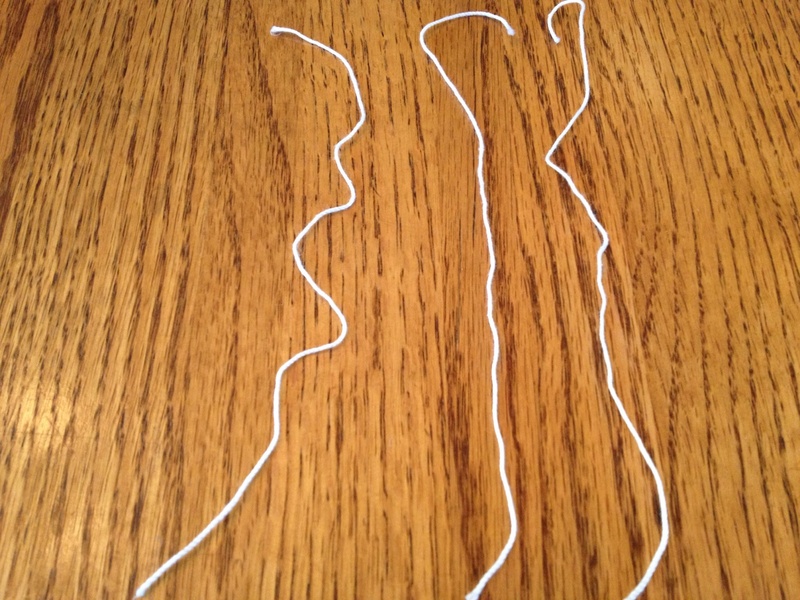 This entry was posted in Techniques The Easy Way, Tools on December 3, 2013 by nina@ninaknit.com.